© Peanut Butter & Co. It takes a certain level of notoriety before there’s a drink named after you. (Arnold Palmer. Shirley Temple.) But you’ve really made it when there’s a sandwich named after you. 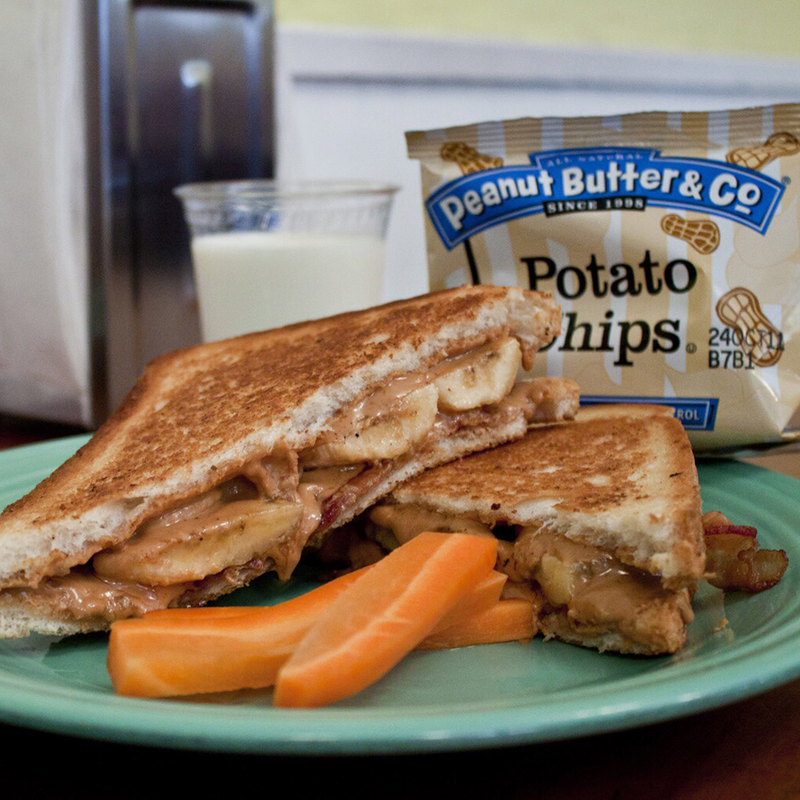 A pan-fried sandwich with peanut butter, banana and bacon, the Elvis was said to be a favorite of Mr. Presley. The Wall Street Journal notes that the sandwich well predated Elvis’s popularizing of it; still, it’s become inextricably associated with the King (and there are far worse legacies to have). “It’s an indulgent treat for sure, with lots of wonderful flavors and textures,” says Lee Zalben, founder of Peanut Butter & Co., in New York City, and perhaps one of the world’s foremost peanut butter sandwich experts. “The crisp fried bread, the rich, gooey peanut butter, the sweet creaminess of the bananas, and of course, the salty crunch of the bacon.” And Zalben adds honey for some extra sweetness. The bread. Some folks get fancy with baguettes or brioche, but as far as we’re concerned, good old American white bread is the ideal vehicle for anything peanut butter–related. The filling. Peanut butter and banana are the two key elements of an Elvis, and if you’re really getting into the spirit of indulgence, bacon too. According to Everyday Southwest, Elvis’s mother made the sandwich with bacon, peanut butter, and bananas that she actually fried in bacon fat—a brilliant touch. Peanut Butter & Co., NYC. In an age of specialty grilled-cheese shops and one-hit food wonders, Peanut Butter & Co. has the longevity to prove its cred—it opened way back in 1998—plus obvious expertise in the peanut butter department. The Elvis sandwich at their West Village shop can be ordered with or without bacon. “The Elvis is one of the most popular sandwiches at Peanut Butter & Co.,” says Zalben. Make your own. Peanut butter, banana and bacon, plus a frying pan; you can handle that, right? Try Mama Presley’s bacon fat–banana trick and you’re good to go.